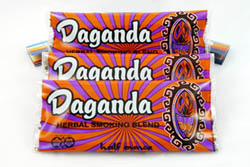 Daganda is based on a ritual burning blend that combines traditions from the Gypsies of ancient India and modern central Europe, Peruvians and the Middle Eastern Moors, which may give this particular blend curious shamanic properties. This blend combines the power of sweet scented roots with herbs that not only provide a smooth, tasty, satisfying smoke, they offer a sense of pleasant repose that lasts for a pleasant amount of time. Ingredients: Pure shade dried herbs and herbal oils of Leonotis, Wild Lotus petals, Cyperus, Davana, Neel, Wild sage, Acacia, Artemesia, Sassafras, Scullcap, galangal, Wild Turmeric, Mullein, Nutmeg, Calamus, Valerian, Vervain, and a proprietary oil blend.